Immerse yourself in the world of colors by Gudrun Sjödén. We were inspired by the Swedish designer and gave the rooms a touch of color and beautiful fabrics. Beautiful details with flowers and ornaments give the whole a Nordic flair. Natural comfort and comfortably furnished rooms make your stay in our hotel a very special experience. The double room is very spacious and has a bathroom with shower and toilet, a cozy couch, a TV and a radio with CD player. This double room offers a view of the Borner harbor. A memorable Darßer captain's house, which was reconstructed with great attention to detail. We welcome you with family and cultivated hospitality. The scent of flowers and herbs, the colors of nature and the view of the harbor with its boats will make you relax. Tasty and healthy food is important to us and a house that is sustainable and ecological, because all life is a cycle and we can often accomplish great things with many small steps. Immerse yourself in the world of colors by Gudrun Sjödén. We were inspired by the Swedish designer and gave the rooms a touch of color and beautiful fabrics. Beautiful details with flowers and ornaments give the whole a Nordic flair. Natural comfort and comfortably furnished rooms make your stay in our hotel a very special experience. We would like to give you pleasure and relaxation on holiday and invite you to discover this wonderful spot of earth. Look forward to a special stay! You are welcome! The restaurant in the house is closed from December to February and every Wednesday except New Year's Eve. A parking space is included per room. 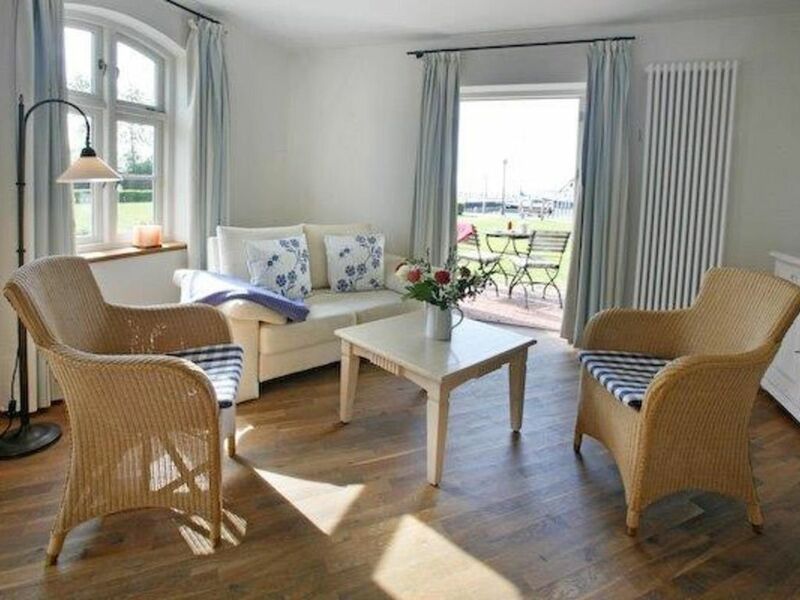 The inn is located directly at the port of Born on the Fischland-Zingst peninsula. There are supermarkets in Prerow and Zingst. Restaurants and cafés are available both in Born and in the neighboring Ahrenshoop, Prerow or Zingst. Doctors and pharmacies can also be found in Prerow and Zingst.